Beirut, 16 February, 2012 --- On February 14, 2012, at 16:20 the security forces in Bahrain arrested two human rights defenders, Naji Fateel and Hasan Al-Jaber, as they were participating in a march towards the Pearl Roundabout in Manama city, exercising their right to peaceful assembly to this symbolic Roundabout, which was the centre of last year protests. Human rights defenders, Naji Fateel and Hasan Al-Jaber, have been kept in police custody at Noaim Police Station since then. Naji Fateel is a board member of the Bahrain Youth Society for Human Rights (BYSHR) who has been active in reporting human rights violations in Bahrain. He was previously detained between Dec 2007 and April 2009, and has been reportedly tortured. His house was stormed in search for him several times last year following the crackdown on pro-democracy protesters. He was suffering from damage to his spine and was supposed to travel abroad to get medical treatment. strong>Hasan Al-Jaber is a prominent human rights blogger who is regarded as a reliable source for Bahrain news. He used his account on Twitter (https://twitter.com/#!/HasanAljaber) for dissemination of human rights information. He used to report from protests, posting first-hand testimonies of human rights violations to the media. In the afternoon of 14 February 2012, both Naji Fateel and Hasan Al-Jaber have been arrested by Bahrain security forces after they were fired at by the riot police with stun grenade and tear gas as they were approaching the Pearl Roundabout. According to available information, the interrogation started with last night and they will be taken to the public prosecution shortly. There are concerns about their safety, due to the fact that the security forces tried to arrest Fateel before and it is feared that he may be tortured or ill-treated again. 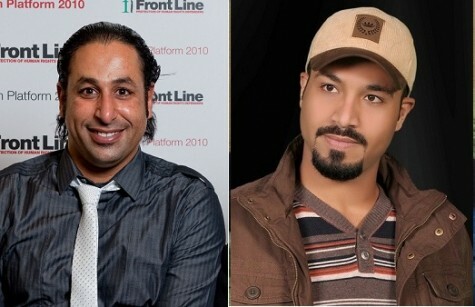 The GCHR and BCHR are very concerned about the arrest and detention of both Naji Fateel and Hasan Al-Jaber, and believes that the arrests and detention are directly related to their human rights work, in particular the involvement of Fateel in talking about torture to international organizations and involvement of Al-Jaber in tweeting about human rights violations. The GCHR and BCHR are concerned for their physical and psychological integrity while in detention. The Gulf Centre for Human Rights and Bahrain Centre for Human Rights call on the Bahraini government to immediately release Naji Fateel and Hasan Al-Jaber. The authorities in Bahrain should stop harassing and targeting human rights activists and allow them to continue their legitimate activities without obstruction. strong>The Gulf Centre for Human Rights is an independent centre and has been registered in Ireland. The Centre works to strengthen support for human rights defenders and independent journalists in Bahrain, Iraq, Kuwait, Oman, Qatar, Saudi Arabia, United Arab Emirates and Yemen.